I read everything I could get my hands on regarding TS Web Access before proposing it to a client who needed to work from off-site. Normally I would have pushed for SBS2003, but it’s about to be replaced and this client had no use for Exchange. My installation had no value for DefaultTSGateway, and technically, even this screenshot is wrong. You need to specify your TS Gateway’s external FQDN. 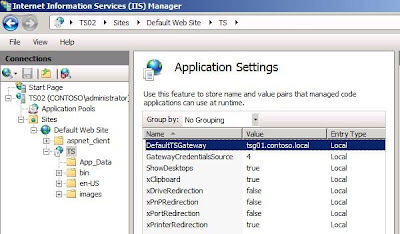 The term “DefaultTSGateway” is not even mentioned in the Windows Server 2008 TS Gateway Server Step-By-Step Setup Guide so I can only assume that my installation encountered an error which left out this value. Then again, Googling the now known solution turns up others with the same problem.